Not so long ago Britain was a proud nation. For decades the British bike manufacturers had been world leaders. Norton, Royal Enfield, Matchless, AJS, Triumph and BSA (among many) had led where others followed. And copied. We were the envy of the world. Then, inside of one very short decade (the 60s), it all came crashing down. Short-sighted factory bosses underestimated the threat from the Orient. When the struggling last survivor Norton-Villiers-Triumph was, in 1983, put into liquidation the mass production of British motorcycles ended. Some well meaning people attempted to resurrect various marques, but most simply faded by the wayside (with one very notable exception, of course). In 1986, construction giant John Bloor bought the rights to the Triumph name. By 1991 he had the first of a new generation of British bikes rolling off the Hinckley production line. These were bikes that didn't follow Triumphs of old. They didn't leak oil, they were more reliable and didn't follow the stylings of yesteryear. These were a new generation of Triumph, built to sell to a new breed of owner rather than to please the classic crowd. And they've been a massive success. The figures speak for themselves; Triumph is now the UK's biggest vehicle manufacturer with 47,500 bikes rolling off the production line in 2006. But which model has been their mainstay over the last six years? The Bonneville. In 2001 Triumph launched a parallel twin styled on the 60s Bonneville. And they called it... the Bonneville. In an unashamed nostalgia trip Triumph unveiled this modern classic. Six years later and with six variations on the theme - Scrambler, Thruxton, America, T100, Speedmaster and Bonneville - Triumph has sold 54,000 Bonnies. Triumph has been rather clever with the Bonneville. Instead of a vague attempt to recreate the actual motor of old it has instead kept just the original format, i.e. a parallel twin. Unfortunately the new power plant doesn't quite have the character of old. While the original was the CBR600RR of its day and favoured by rocker racers, you aren't going to be doing much tearing around on the new Bonneville. For 2007 the Bonnie gets the new 865cc motor, but it's still a bit of a wet drip. There's nothing really wrong with the engine - it's smooth, has reasonable midrange and the gearbox isn't too bad - but it's about as devoid of character as a Celebrity Big Brother contestant. The Bonneville's exhaust note is an absolute dead ringer for a sewing machine. But considering who this bike is aimed at, this isn't a problem. You see Triumph has targeted the Bonneville at the kind of rider who doesn't want a fast, intense, focused bike. This is a fun, good looking machine that's reliable and will start at the push of a button. And in this respect the Bonneville is perfect. Sitting on the long, well-padded seat, reaching for the high bars, you are instantly put in a position of comfort. Unlike race reps you don't feel the urge to adopt a racing crouch and chase every other bike on the road. No, on the Triumph you sit back and enjoy the ride. And it's not a bad ride at all. Yes, the engine is a mite disappointing, but only if you've ridden a modern bike or you want to go fast; for the back-road amble it has more than enough drive. The suspension is a bit soft for enthusiastic riding, but those settings mean you're not catapulted out of the seat at every pothole or imperfection in the road. And while the brakes are a bit weak, to be truthful you aren't going to be going that fast on a Bonneville anyway. Out of the three British bikes here you can see why the Bonneville is the big seller. On a cold and frosty morning, having been left outside all night and with ice still on their tanks, which bike started first time? The Triumph Bonneville. Modern biking wrapped up in a retro veil. Chicken tikka masala is the UK's best selling takeaway dish. But if you take one to India no one will recognise it because no such dish actually exists there. This culinary delight was invented in Glasgow in the 1970s. So, although it was invented in Britain, it is cooked, sold and eaten in Indian establishments. So is it Indian? 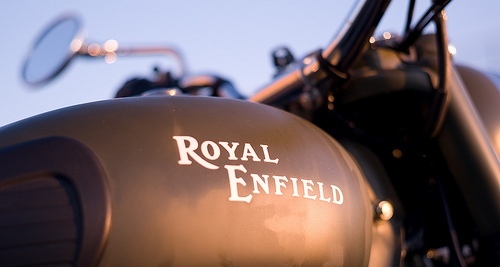 Royal Enfield is a British company, founded in the 1890s. But like most other British bike manufacturers it went pop. This bike is an Indian Royal Enfield, built in India and imported back into the UK. So is it British? Who cares? The name on the tank is British. And to be fair, most of the Triumph's components are made abroad anyway. When it comes to authentic retro riding you can't get much closer than the Enfield. To all intents and purposes, this is the same bike that was churned out in Britain until 1970 when the factory shut its doors. But while UK production halted, a satellite Indian factory, built to supply Bullets to the Indian army, has continued making the bike to this day. Despite the recent revolutionary changes of adding a left-hand gear change and electric start, the basic design of the Enfield has been left manifestly unchanged. Fire up the Cafe Racer and it sounds like a British bike should: loud and proud. There is no way those pipes are road legal, but the Enfield gets away with it. Unfortunately the Enfield also rides like an old British bike. Where the Triumph looks old but feels modern, the Enfield looks and rides like a bike from another era. The skinny tyres, wobbly suspension, poor brakes and, in the case of the Cafe Racer, tucked-in riding position make riding the bike an interesting experience. It will chug away at a fairly happy 60mph but I wouldn't recommend attacking your favourite bends with any gusto. But again we must ask: who is the bike is aimed at? Over Christmas I was talking to the local vicar from the village where my folks live. Over a pint he was telling me about the Enfield he'd had for a few years, a modern Indian Enfield. He loved it because it looked like an old bike, but came with modern electrics and more than a fair chance of starting every morning. Well it wouldn't do to keep his flock waiting on a Sunday, would it? So God-fearing folk like this, then, are the kind of riders who appreciate the Enfield for what it is, a real retro bike with (barely) enough of a modern makeover to keep its character while making it more reliable. Okay, it's not perfect. The electrics are still dodgy - our bike broke down after about five minutes when water got in there - but to the enthusiast this isn't a problem. I reckon that Enfield owners are secretly waiting for their bikes to not run quite right so they can approach them with a spanner. It's funny, but looking back at riding the Enfield I can kind of get the point. It's an authentic classic experience, only with just enough modernity to make that experience pleasureable. And you could leave it standing a year and it would still start, God willing..
After a spell in the cold CCM is back in business. Despite going into receivership in 2004, Alan and Austin Clews (CCM stands for Clews Competition Motorcycles) bought the company back off the liquidators and decided to concentrate on making small runs of hand-built bikes. And it's working for them. Last year CCM took orders for over 80 bikes, which may not sound a lot but for a small company from Blackburn that's not bad going at all. The C-R40 is their latest model. Like all CCMs this bike doesn't use their own engine. What's the point in a small company spending a fortune making a motor when it can just buy one, ready developed? In this case CCM has again let Suzuki do the work and simply bought a DR-Z400 engine, complete. Which is a good choice because the DR-Z's is a beautiful motor. Despite being only 398cc and having five gears it's still frisky, pumping out a decent 42bhp which, in a bike as stripped down as the C-R40, makes it feel pretty fast. The single cylinder lump revs quickly and smoothly and has near perfect throttle response thanks to it still using a single carb rather than fuel injection. It may not be that quick at the top end - I reckon you'd struggle to top 90mph - but would you really want more on this type of machine? Like the other British bikes here the CCM is a retro racer designed for Sunday blasts, not day-to-day commuting, which is why you can forgive it some of its faults. It's also worth mentioning that the bike we tested is basically a running prototype, so many of these criticisms will be ironed out in the final production bikes, but a few are simply inherent in the design. For a start the forks are set way too soft, meaning that even a slight touch of the front brake results in a huge amount of dive. And there are a few design issues, such as the gigantic footrest hangers and horrible clocks. James, who knows the guys at CCM, was straight on the phone about them and was assured they would all be ironed out. It's the advantage of short-run hand-built bikes - changing fork oil, springs etc. is simply and readily done. What will be trickier to iron out is the bike's geometry. In designing the C-R40 the guys at CCM stuck to what they know best, so the chassis is basically a modified off-road chassis. With a very short wheelbase and sharp steering geometry what we have here is a very light handling bike that wheelies at the first sign of throttle input. Unlike the Triumph and Enfield, which really aren't that keen to misbehave, the CCM is more than happy to play the fool. And that makes for one hell of a ride. You can't really just hop on the C-R40 and go for a gentle trundle like you can on the other two. The CCM's riding position, combined with its very small size, puts even shorter riders in a racing crouch and relegates the CR-40 to a Sunday blast bike. The problem is how many riders can afford £5840 for a weekend toy, even if it does look great? But this is the kind of market that CCM is in. Yes, it is an expensive bike, but for your money you are getting a unique, hand-built machine that looks great and is fun to ride. Can you really fault it for that? Out of the three bikes here the Bonnie is by far and away the most practical and usable machine. In recent years Triumph has been very good at producing retro bikes with just enough of the look and feel of the original to spark a bit of nostalgia, but with all the modern production methods and reliability that people naturally expect these days. The Bonnie behaves in exactly the way its looks tell you it should. Weighing over 200 kilos and with around 60bhp on tap the Triumph's never going to break any speed records. And it doesn't. It has old-style geometry and simple suspension so it should be slow steering and stable. And it is. And that front brake has just the one disc and a small caliper gripping it, so it won't be good for practising your stoppies on. And guess what? It's not. It may not be the most exciting bike but I'll tell ya what, it looks the part and you feel good riding it. I've had a Bonnie Scrambler all summer and have done more miles on that than on any other single bike for as long as I can remember. Call me old fashioned, but I like 'em ! Now this, within the context of cool retro Brit iron metal, is the opposite of the Bonnie. A 50-odd year-old design with none of the modern production techniques or reliability that people expect these days. The only thing I like about this bike is the feel of the engine. Its long stroke and huge flywheel coupled to that exhaust note is pure 1940s and 50s British bike charm. Almost everything else about this bike annoyed me. The build quality, the kick-start lever that gouges away at your shin as you ride, the way we had to push it up and down the street to get it going, and the general built-in-a-shed look of the thing. I'm not saying it won't appeal to anybody - it probably will - and most likely for some of the very reasons I don't like it. But if that's what you want why not buy an original ? It won't cost a lot more and you won't have to pay any road tax on it. The C-R, or 'Cafe racer' 40 is the third in a line of retros from micro manufacturer CCM. It shares the same Suzuki DR-Z motor with the FT (Flat-Track) 35 and the SC (Street Scrambler) 40. Compared to the steady Enfield and the larger, heavier Triumph, the CCM feels like a toy. Riding position is a bit more stretched- out and sporty, but not uncomfortable. On the road the C-R is fairly lively, especially in the lower gears. That single cylinder motor has a smaller flywheel than the Enfield so when you blip the throttle you get more of a bark, instead of that slow wind-up typical of old British singles. I probably shouldn't say so in this type of test (complaints to the usual address), but the C-R was dead easy to wheelie. It'd come up in first then you could just slot through the box quite easily. The C-R 40 looks the part and is fun to ride. It's never going to be a practical, everyday machine, but it'll make you grin. Okay, the British bike industry isn't anywhere close to regaining its previous glory as world leader, but it isn't doing too badly. Triumph has shown that a British name on a tank still carries kudos, and if you give riders what they want the market is still out there. Alright, the Bonneville may not be a worthy successor when it comes to performance comparisons with its namesake, but this is a new era and the Triumph provides a generation of bikers with exactly what they want - a good looking, reliable bike that tugs on the heart strings. Considering the current state of British industry the Triumph brand is an amazing success story and as long as it keeps producing its unique style of bikes it's only going to get stronger, which is fantastic news. Although Royal Enfield is never even going to get close to rivalling Triumph when it comes to UK sales it's still refreshing to know that here's an old British bike still being made (even though it's in India). For the classic enthusiast that wants a running machine rather than a leaky garage ornament the Enfield would be ideal. It doesn't have the Japanese reliability, but any problems would be fairly easy to sort out with some basic workshop knowledge and a bit of water resistant connector grease! And as for CCM, this could be the next success story. Like Triumph this little Blackburn manufacturer has spotted a niche market and hit it. After the NEC show CCM took so many orders for both the Flat Track and the Cafe Racer it is struggling to keep up with demand, which is excellent news. Unless you're waiting for a bike... Okay, CCM is only ever going to be making hand-built bikes in small numbers but at least it's making them. For a company that was in receivership just two years ago that's quite a turnaround.